I’m about 20 minutes late when I meet Andrew Mason at the famous Boudin Bakery in San Francisco’s Fisherman’s Wharf district. It’s a tourist trap, but it’s where Mason wants to meet and who am I to complain? I’m about to get a sneak peek at the thing he’s been working on for the last several months. I apologize profusely for my tardiness. Traffic was horrible, my Uber driver didn’t know where he was going, etc. But the real reason I was late is that I severely underestimated the time it would take me to get to the other side of the city. I never go there, because it’s a tourist trap. What Mason is about to show me might change that. At least he hopes so. After a few minutes, Mason hands me an iPhone with an early build of his new app, called Detour. I plug my headphones in, Mason taps his phone a couple of times, invites me to join his group, and we’re ready to go. 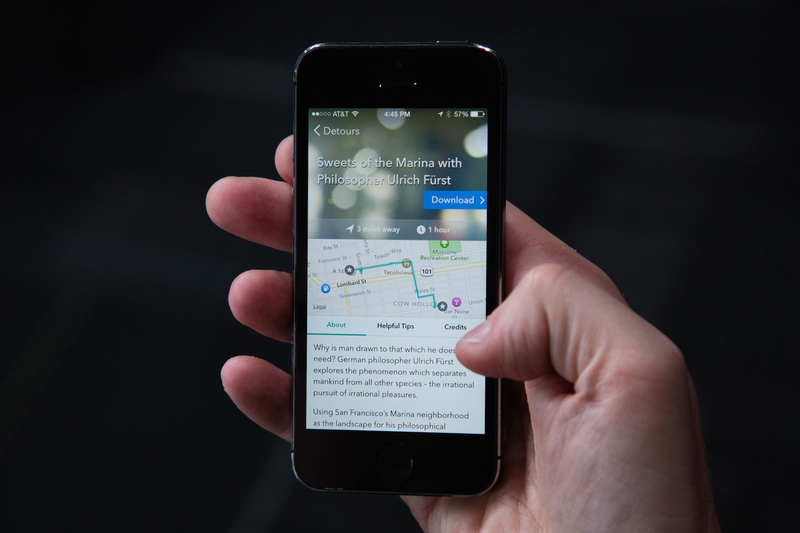 Detour is basically the San Francisco tech version of your typical walking tour. It’s an iPhone app designed to guide you through different parts of a city and introduce you to new places and people that live there. The app takes a very content-centric approach to that process, and the people you’re listening to are more like storytellers than they are guides. We’re in demo mode, and a virtual tour guide whispers in my ear, instructing us to walk between a couple of touristy seafood restaurants and through a door to a quiet dock lined with fishing boats. After a few minutes, the voice of a fisherman takes over. He’s talking about the trade, how he got started, what it was like in the olden days. It’s all very NPR. I could imagine listening to this guy telling his story on Radiolab or This American Life. As he guides us around the pier, I realize the only other people around are the workers loading seafood onto trucks. There are definitely no tourists. That’s part of the appeal. It’s not just about building walking tours that are informative, but creating walks that are “more like a location-based documentary,” Mason told me. Mason, of course, is the quirky founder and former CEO of Groupon. He rode one of the biggest tech roller coasters of this era, overseeing the meteoric rise of the daily deals site, as well as its dramatic fall. At the time of its IPO, Groupon was valued at $12.7 billion. By the time he was fired, the value of its shares had fallen about 80 percent. That’s the story of Groupon in a nutshell. After all that, Mason moved from Chicago to the Bay Area to start anew. At some point, he recorded a cheesy album of motivational business songs. And not long after that, he began working quietly behind the scenes on this next project. It’s now 18 months later and Mason is ready for his next act. He looks healthy and happy in jeans and a black t-shirt. Almost like a kid who has successfully returned from fat camp. But after building a company worth billions of billions of dollars — even following its colossal stock collapse — why make something as seemingly mundane as an audio tour app? Mason first wanted to work on something like Detour after going on vacation with his wife to Rome. Both of them hated walking tours with large groups, and they didn’t want to walk around with their noses in a guidebook. Instead, they listened to an audio tour together. That was better but still imperfect. The two of them were sharing one set of earbuds, which kept getting pulled out of one or the other’s ear. The tour didn’t do a great job of keeping pace with them as they walked around. And finally, the things being pointed out were generally more touristy stuff. “Ever since the App Store came out I have looked for this app,” Mason told me. That’s not to say there aren’t audio tour apps out there. But they lack some pretty basic features that Mason was looking for — stuff like location awareness and the ability to sync up audio between multiple people who are walking around on a tour together. Furthermore, Mason was hoping to find an app with audio tours which were a bit more off the beaten path. Without being able to find what he was looking for, he decided to build it. For an app that is very content-heavy, there’s interesting technology baked in to make it work. The first aspect of Detour that sets it apart from most audio tour apps is that it’s location-aware. Using a combination of GPS and iBeacons, Detour can pinpoint where users are to ensure that they’re listening to the correct part of any tour. Mason and team have also worked hard to ensure that all the audio is synced between different users in a group that are listening to a certain tour. It does this using Bluetooth Low Energy wireless pairing between phones, connecting them all on a mesh that makes certain that if one person pauses a tour, it’s paused for everyone. On the back end, the startup has built a publishing suite that allows its producers to first build tours based on where they want to go on a map, and then plot out the script and record the audio. But once that tool is more fully baked, Mason envisions opening it up to third-party producers who could create their own location-based audio walks around areas that they know well. The hope is that Detour can not just create interesting, informative walks on its own, but it can create a whole new medium for others to tell their stories. And that’s when things get really interesting. 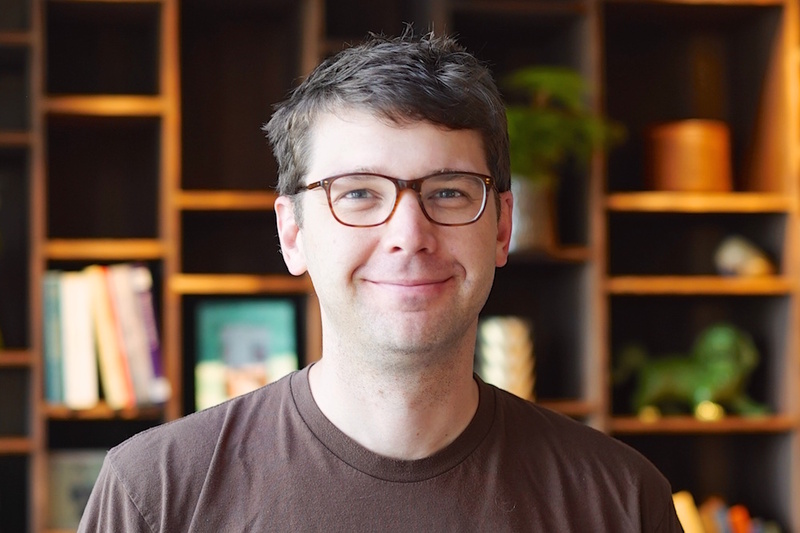 It’s at the end of the tour, when we finally sit down to talk about the experience, that Mason really waxes philosophical about the app and why he chose to make it. On the one hand, there’s the obvious sale to tourists who are trying to find out more about a place that they’ve just visited, and giving them a tour they probably wouldn’t have taken otherwise. But Mason sees an even bigger opportunity to help residents find out more about the history of the cities they live in. The real goal, he says, is to make the real world more interesting, and that might be the reasoning behind the app’s killer feature: Once you start a walk, you should never have to look at your phone. The narrator guides you from place to place, and you’re able to move at your own pace, but there’s no peeking at maps trying to decipher where you’re supposed to go next or tapping buttons to move on to the next part of the tour. “My hope is that we can find ways that… instead of taking life’s rough edges and polishing them, we can get people to celebrate them,” Mason told me. It’s a very utopian idea — allowing technology to blend into the background so that people can enjoy the world around them a little bit better — but it’s at the heart of Detour’s mission. If Mason can get me to not only hang out in Fisherman’s Wharf for an hour, but also enjoy it, he might actually have succeeded.